Confederation Centre Art Gallery holds a significant collection of Canadian historical, modern, and contemporary art, artifacts, and archival records. Since the gallery began collecting in 1964, its holdings have grown to over 16,500 items including a comprehensive research collection on the works of Charlottetown-raised, Robert Harris (1849-1919), painter of the iconic group portrait, The Fathers of Confederation. While 19th and early 20th century holdings are acquired less frequently than contemporary works, we are fortunate to have pre-Confederation works by such artists as Cornelius Krieghoff, George Thresher, and Fanny Amelia Bayfield. Early 20th century artists George Pepper, Kathleen Daly, and Frederick B. Taylor, are collected in some depth. Quebec painter, Jean Paul Lemieux’s commissioned mural, Charlottetown Revisited, 1964, is a highlight of the Confederation Mural Collection, as is the 1997 painting, Those Who Share Together Stay Together, by Jane Ash Poitras. The Expo ’67 Collection of fine craft, while slightly out of scope, is a fascinating time capsule of that centennial year. Similarly, the L.M. Montgomery Collection of 16 novel manuscripts is a delightful anomaly, with international cultural resonance. The collection continues to grow through the generosity of donors and we are very grateful for this support. 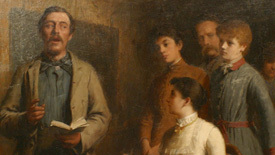 Robert Harris, The Local Stars, (detail), 1888, oil on canvas, 80.0 x 105.4 cm.